Stratasys has introduced software that combines advanced color management with a direct design-to-3D print workflow. The new Stratasys Creative Colors software, powered by the Adobe 3D Color Print Engine, is designed for the company's Objet Connex3 3D printers. The software forms a bridge between Adobe Photoshop CC and Objet Connex3, allowing Photoshop users to 3D print their designs directly — without the typically complex 3D printing workflow. 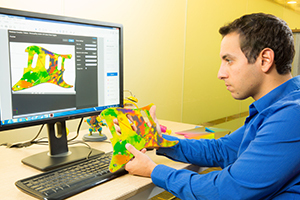 In addition, the software offers "vibrant gradient color palettes with expanded color spectrums, improved textures and patterns support, as well as accurate, time-saving color previews," according to a statement from Stratasys. The company boasts that "by incorporating multiple gradient colors, patterns and textures, combined with the 3D printer's multi-material capabilities, a model produced on the Objet Connex3 can have the same look and feel as the final intended product." With Stratasys Creative Colors, users can also send their 3D printing files from Photoshop CC to Stratasys Direct Manufacturing, the company's parts-on-demand 3D printing service. The software includes features such as direct quoting, validation and previewing. All new Objet Connex3 3D Printers now come with Stratasys Creative Colors, and the software can also be purchased for existing Objet Connex3 systems. For more information, visit the Stratasys site.